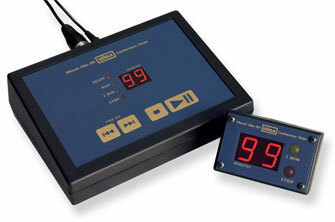 The Minute Man 99 minute Conference Timer is ideal for Conferences, Lectures or Debating. It’s easy to use and features a Remote Display which can be positioned up to 200 metres/660 feet from the Master Unit, receiving both power and signal via standard microphone cable. Remote Displays have a large 20mm/0.8 inch digit display which can be read at a distance and are ideal for placement on Lecterns, Foldback Monitors or Technical Operator Control Desk. Multiple Remote Displays may be employed and the standard Plugpack PSU will support up to 4 units. Operation is simple and has been designed so that non technical people can gain a quick understanding of the functions. Just like a CD player, the Up/Down buttons set the Start Time, Go/Pause is self explanatory, and pressing the Stop Button takes you back to the automatically memorized Start Time at any point during or after the Countdown. On the Master Unit the decimal point flashes while time is counting down, and freezes when time is paused or stopped. Also, a kind of “traffic light” arrangement gives further visual confirmation of what’s happening. The Remote Display also features two 10mm/0.4 inch Warning Lights, the first of which shines Yellow when the time passes below 2 minutes. The second one flashes Red when the time reaches zero, and continues to flash until the Master Unit is re-cued. Another neat feature is that when time passes below 1 minute the unit counts down in seconds, allowing presenters to synchronise their final remarks, and adding extra emphasis to the low time warning. The Minute Man 99 Conference Timer is supplied with 1 Remote Display Unit as standard and more may be purchased separately as required. BIG DISPLAY Jumbo sized display with 100mm high (4") numerals. Comes with standard VESA or your specification of M4 threaded mounting centres, and either panel mount or cable mount XLR. Unit draws its power up the XLR from the Master Unit, same as the regular displays. Overall dimensions: 225 X 150 X 55mm. Minute Man 99 Case Budget Light Aluminium Case Single unit light aluminium case fitted with foam inserts to house a Minute Man 99 set. Enough room inside to store master unit, 2 remote displays and plugpack PSU. Overall dimensions: 410 X 280 X 95mm.